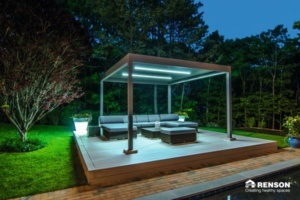 Bioclimatic Louvre Pergola Shade Systems are the latest trend in outdoor shade solutions, giving a contemporary dimension to outdoor spaces with a touch of luxury. With modern and clean designs that are engineered to the highest levels of quality, these Louvre Roof Systems are perfect to use in absolutely any kind of weather condition – sun, rain or wind. The Louvre roof systems include structures made with motorised tilting blades that rotate to allow for sunlight and airflow. This allows for a certain degree of shade and also lets a fresh breeze through to cool you in warm weather. Our Pergola Shade Systems are ideal for summertime out in the garden, as they provide you with a perfect balance of exposure to the beautiful climate yet protection from heat and sun rays. 100% water proof with an integrate gutter all around. Available in small and large sizes and option to join to create larger spaces. Different options to cover the sides suitable for various budgets. Here, at awnings and canopies, we work with a few manufacturers not only across Europe, but around the World, each with different functionalities and advantages of their own. Should you wish to know more about our Louvre roof systems or, if you would like a free consultation regarding a louvre roof or pergola shade system which would involve us gathering your requirements and advising you towards the most suitable product to complement the space you have to work with, then please call us on 07546 343499 or 07546 343411, send an e-mail to info@awningsandcanopies.co.uk or use our contact form and we’ll be more than happy to get back to you as quickly as possible.